Well today is a big day in the life of Suzuka Nakamoto (Su-metal), as she will perform in her home town of Hiroshima tonight (see earlier post) with Babymetal. 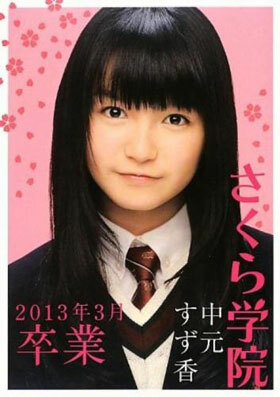 This is the Sakura Gakuin Graduation Book from 2013 that was dedicated to her. She was already going places with Babymetal at that point but this book is showcasing her in Sakura Gakuin and in private. Needless to say, this is not cheap today, but what a wonderful Collectors Item. This weekend is a big moment in the history of Babymetal, and in particular for singer Su-metal (Suzuka Nakamoto). Born in Hiroshima on December 20 1997, Su-metal will soon be 20 years old and as is the tradition in Babymetal they will celebrate this in public. Not on the actual day, but they have booked the 4,750 capacity Hiroshima Green Arena (the biggest in town) for two shows over the weekend. The first night is for fan club members only, the second is split between fan club members and the general public (those tickets sold out in less than one minute). For Su, coming home as a bonafide Rock Star of note is a big thing. Babymetal has never performed in Hiroshima before. I have a tremendous respect for Babymetal, how they handle things. It is a one in a million phenomenon.